The Air Force of Zimbabwe (AFZ) is the air force of the Zimbabwe Defence Forces. It was known as the Rhodesian Air Force until 1980. The Air Force of Zimbabwe saw service in the Mozambican Civil War in 1985 and the Second Congo War of 1998–2001. In 1981, the Air Force of Zimbabwe ordered 8 eight Hawk MK60s, which were delivered in July 1982. On the night of 25 July 1982 a sabotage attack on Thornhill airbase damaged four Hawks, nine Hunters and a single FTB-337G. One Hawk was written off, another was repaired on site and the other two were returned to BAE for a rebuild. A follow-up order for five additional Hawks was completed in September 1992. The first supersonic interceptor operated by the air force was the F7 Airguard, 12 of the IIN and II variants were delivered in 1986. In 1993, a pair of O-2As were delivered for anti-poaching patrols over Zimbabwe's national parks. Two Cougar helicopters were reported to be in use in 1997. One was delivered in April 1995 and the second in September 1996. They were used for VIP duties. The Second Congo War, also known as "Coltan War" and the Great War of Africa, began in August 1998 in the Democratic Republic of the Congo (formerly called Zaire), and officially ended in July 2003 when the Transitional Government of the Democratic Republic of the Congo took power; although hostilities are currently ongoing. Zimbabwe's well-trained military entered the war as the best equipped side. In mid-August 1998, the AFZ deployed five or six F-7s, most of the C.212s, at least four Cessna 337G Lynxs, and a dozen or more helicopters, including Alouettes, Bell 412s and Mi-35s, to Congo. All aircraft were flown by Zimbabwean pilots. After receiving an urgent shipment of spare Hawks, the AFZ apparently deployed some of them as well. At the start of the war, the Hawks had been reported to be in unflyable condition. Due to these circumstances the AFZ contingent in the Congo in August and September 1998 consisted of flights from No.3, No.4, No.5, No.7 and No.8 Squadrons, while a flight from No.2 Squadron was to follow later. The No.2 AFZ Squadron deployed 12 BAe Hawk T.Mk.60/60As, which were used as strike-fighters and equipped with AIM-9B Sidewinder AAMs, Mk.82-series bombs, and Hunting BL.755 cluster-bomber units (CBUs), as well as launchers for unguided rockets. Only six or seven F-7s From No.5 squadron were fully mission-capable. Prior to the war in Congo, Zimbabwe was in the middle of negotiations with China for 12 additional F-7s. For transport, the AFZ had the No.3 Squadron, flying 12 CASA C-212 Aviocar and six Britten-Norman BN-2A Islander light transports which had already seen heavy service, and were to see even more of this in Congo. Transport and liaison were also duties of the No.7 Squadron, equipped with Aérospatiale SA 316B Alouette IIIs (including ex-Portuguese Air Force-and Romanian IAR-built examples), as well as of the No.8 Squadron, equipped with Agusta-Bell 412SPs which were later armed with rocket launchers for this war. However, the latter unit would soon play a significant role in the war in DRC, as it was only recently equipped with the newest addition to the AFZ: six Mi-35 helicopters (including two Mi-35Ps). The first AFZ Mi-35-crews were trained at Thornhill AB, in Gweru, by Russian instructors. CO of this unit was Sqn.Ldr. Mukotekwa. The first noted AFZ operation took place on 26 August 1998, where they destroyed a 5 km armoured column of rebels as they were approaching Kinshasa. After defeating the invaders in Kinshasa, the Zimbabweans, in the belief that Kabila's government was already safe, suggested that there was no need to continue the war, and peace should be negotiated. This resulted in the reinforcement of rebel efforts as well as the Rwandans and Ugandans rushing better-equipped units into the battle. The garrisons in eastern Congo that remained loyal to Kabila fell to rebel attacks. The Ndigili airport, in Kibanseke Province, as well as Kitona, both held by Zimbabwean troops, were attacked simultaneously. In both cases the AFZ responded with fierce air strikes. Rebels claimed that up to 100 civilians were killed by their bombs. On 13 September, when the Angolans attacked towards Kamina, the Zimbabweans found themselves under fierce attacks by thousands of rebels in the Manono area. It was in this area that the AFZ suffered its first documented loss of this war: on 4 September the Aermacchi SF.260 flown by Sqn.Ldr. Sharunga crashed in bad weather, killing the pilot. Nine days later an Alouette III helicopter carrying several high-ranking officers, including Col. Kufa and Sqn.Ldr. Vundla, was shot down by rebels in eastern central Congo. Kufa and Vundla were killed, while Flt.Sgt. Sande was captured by RCD. In late October 1998, the Zimbabweans launched an offensive in SE Congo. The offensive was made possible owing to the deployment of additional foreign troops in Congo, including some 2,000 Namibians. This began with a series of air strikes, partially flown by BAe Hawk T.Mk.60s of the No.2 Squadron, newly deployed in Congo, and by F-7s of the No.5 Squadron. These units first targeted airfields in Gbadolite, Dongo and Gmena, and then rebel and Rwandan communications and depots in the Kisangani area, on 21 November. On the following day the No.2 Squadron launched a strike package of six aircraft, armed with Mk.82 bombs and Matra 155 rocket launchers for unguided rockets calibre 68mm, which reached out far over central Congo. They deployed over Lake Tanganyika and attacked ferries used to transport Burundi troops and supplies into the war in Congo. According to Zimbabwean reports their strike came as a complete surprise. With machine-guns and light infantry weapons as the only means of air defense, six ferries were sunk and 600 Burundi and Rwandan troops killed. In a similar attack, on 7 December 1998, Zimbabwean planes or helicopters sank two rebel boats on Lake Tanganyika some 40 km north of Moba. In November 1998, it was reported that a $54 million shipment of helicopters, fighters and spotter aircraft had arrived in Zimbabwe to assist in the Democratic Republic of Congo. It is unclear who received the delivered weapons. There were only very few reports about the fighting in the next few days, probably because the Congolese, Zimbabwean and Angolan governments found themselves under heavy pressure from Western powers because of this offensive. The few reports released from sources close to the rebels indicated Zimbabwean and Congolese attacks on Nuyuzu, Kasinge and towards Manono, supported by T-62 tanks and heavy artillery. According to Zimbabwean reports the Hawks and F-7s continued their operations and made additional attacks against Kalemi on 24 November, and a new round of strikes against different airfields in eastern Congo two days late. After the attacks the pilots of No.5 Squadron claimed destruction of an unidentified An-12 transport on the ground. The AFZ is subdivided into the Administration Wing, the Engineering Wing, the Flying Wing, and the Regimental Wing. The Administration Wing supports equipment purchasing, recruitment, staff support, food supplies, and related functions. The Engineering Wing maintains and inspects aircraft and related equipment, and covers the School of Technical Training, a tertiary education institution responsible for training aircraft maintenance engineering technicians. The training institute is the only federation aviation school in Africa. The Flying Wing handles aircrew personnel divided into eight squadrons at three primary bases. It also covers the schools for flying and parachute training. The Regimental Wing covers those squadrons specially selected to guard other AFZ assets, such as personnel and installations. and weapon ativations. It is difficult the ascertain a list of aircraft types operated by the Air force of Zimbabwe because of secrecy. AFZ has been constantly linked to Mikoyan MiG-29 since 1980 and even sent pilots to the then USSR for training. In February 2002 the EU enforced an arms embargo on Zimbabwe in reaction to severe violations of human rights in the nation. Unable to buy spare parts for the British designed and manufactured BAe Hawk, in 2006 the air force received the first K-8. The air force also has Mikoyan-Gurevich MiG-23 fighter jets donated by the late Muammar Gaddafi. K-8 Karakorum Trainer at Ysterplaat Airshow, Cape Town. Zimbabwe has been interested in MiG-29s in both the recent and more distant past. A 300 million-plus US dollar order for a squadron was placed with Russia in the late 1980s but was cancelled in 1992. Negotiations to buy 14 MiG-29SMTs from Russia were held again in 2004  but an order for Chengdu FC-1 fighters was apparently placed instead. The Zimbabwe Air Force is also sending its officers to attend PAF Combat Commanders School and Pakistan Army School of Army Air Defence each year for Advanced Training. Hawker Hunter FGA-9 - around a dozen or so aircraft retired; left-over from the Rhodesian era. BAC Canberra B-2\T-4 - left-over from the Rhodesian era. De Havilland Vampire FB-9\52 T-11\55 - replaced by BAE Hawk 60 (below). BAE Hawk (1982-2011) - replaced by K-8 trainers after lack of spare parts, due to a British arms embargo that started in the year 2000, left these dozen or so remaining aircraft difficult to use. Douglas C-47 Dakota - 10 of these aircraft are currently in storage. AL-60F-5 Trojan - left-over from Rhodesian era. An-24 Coke - formerly operated. AS532 UL Cougar - 2 unarmed utility helicopters retired. Boeing 720-025 - formerly operated by Air Zimbabwe. Cessna 206 - formerly operated. Cessna 320C - formerly operated. Y-12 Panda - formerly operated. Yakovlev Yak-40 - formerly operated. Provost Mk 52 - around two dozen of these armed trainer/light attack aircraft retired from the Rhodesian era. Baron 95 C55 - one unarmed utility aircraft left-over from the Rhodesian era. Agusta-Bell 205A - around a dozen of these armed helicopters left-over from the Rhodesian era actually sold in 1990. Douglas C-54 Skymaster - retired transport from the Rhodesian era. The AFZ's rank structure is similar to the RAF's rank structure from where, via the Rhodesian Air Force, its ranks were derived. Exact figures for the Air Force of Zimbabwe's aircraft losses have not been publicly published. It is believed four Hawks were lost, three F7s and several helicopters. Michael Enslin, 21 years of age the time, was shot down in a BAe Hawk at 1000 feet while recovering from a dive. He survived for 5 days in the bush until he was rescued. He was the third pilot to be shot down. SF.260MC flown by Sqn.Ldr. Sharunga crashed in bad weather, killing the pilot. The Pilot Wing Commander became disorientated at night while on the way to take part in a flypast at Laurent Kabila's funeral, and the pilot ejected. He was found alive in the jungle by Zimbabwean troops five days later. ↑ "Curfew in Kinshasa". BBC News. 26 August 1998. Retrieved 30 March 2010. ↑ Dinar, Ali B. "IRIN-CEA Weekly Round-Up 50-98 1998.12.11". African Studies Center. University Of Pennsylvania. ↑ Cooper, Tom. "Zaire/DR Congo since 1980". Central Eastern, & Southern Africa Database. ACIG.org. 1 2 "Air Force of Zimbabwe". Aeroflight. 9 March 2003. Archived from the original on 4 July 2007. Retrieved 27 July 2007. 1 2 3 4 5 6 7 8 9 10 "World Air Forces 2015 pg. 34". Flightglobal Insight. 2015. Retrieved 27 May 2015. 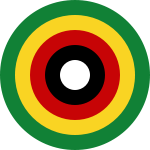 ↑ Latimer Clarke Corporation Pty Ltd. "Zimbabwe - Atlapedia® Online". Atlapedia.com. Retrieved 2013-02-22. ↑ "The Zimbabwe Situation". The Zimbabwe Situation. Retrieved 2013-02-22. ↑ "Archived copy" (PDF). Archived from the original (PDF) on 16 June 2013. Retrieved 2009-09-25. ↑ "Zimbabwe Air Force". 11 June 2008. Retrieved 13 December 2012. ↑ "Zimbabwe beefs up air arsenal". 7 June 2005. Retrieved 10 December 2012. ↑ "Zimbabwe: 'Purchase of Jets From China Wise'". 1 July 2005. Retrieved 10 December 2012. 1 2 "Zimbabwe Air Force". 15 July 2006. Retrieved 10 December 2012. ↑ "Air Zimbabwe Boeing 720-025 VP-YNL". Retrieved 11 December 2012. ↑ "Agusta-Bell AB.205A 'Cheetah' *Retired*". 22 February 2003. Retrieved 14 December 2012. ↑ Nkatazo, Lebo. 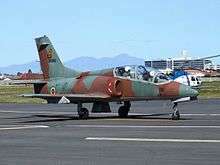 "Zimbabwe Air Force jet crashes, 2 pilots said. old.". newzimbabwe.com. Retrieved 27 January 2012. ↑ "Air Officers Commanding Rhodesian Air force 1949 - 1981". The Rhodesian Air Force. rhodesianforces.org. Retrieved 27 January 2012. ↑ Cooper, Tom. "Mozambique, 1962-1992". acig.org. Retrieved 27 January 2012. ↑ "Air Force Of Zimbabwe". Ministry of Defence. mod.gov.zw. Retrieved 27 January 2012.